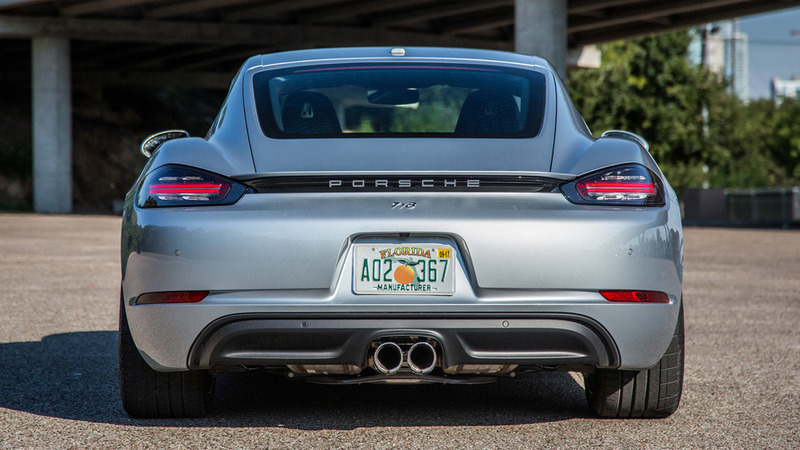 Between B-roads and bites of BBQ, we find renewed glory in Porsche’s baby coupe. The best Hill Country roads dig deeply into the terrain, the topographical features that name the place rising around you like seemingly engineered bulwarks of dry, loose soil. 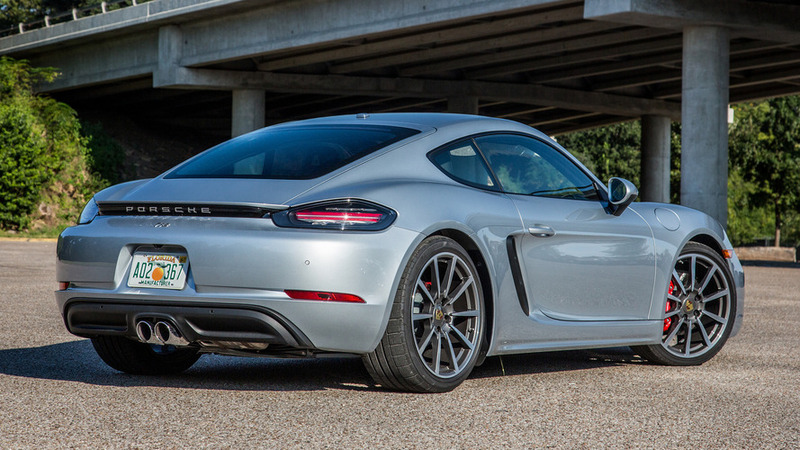 In the deepest trenches of ribboned asphalt, the sound from the Cayman’s exhaust rockets off hillsides, echoing a punchy, high-decibel riot behind me as I careen over the Texas expanse. The sound is loud and gets louder as I get braver with the throttle – and I was pretty brave to start. People don’t seem to like the song of turbo-four engines, or boxer engines; nor do car people tend to love when a model that historically used a naturally aspirated unit moves to forced induction. There are some opinions along those lines amongst the writers in attendance at this launch of the 2017 Porsche 718 Cayman, too. They can all hang, as far as I’m concerned. 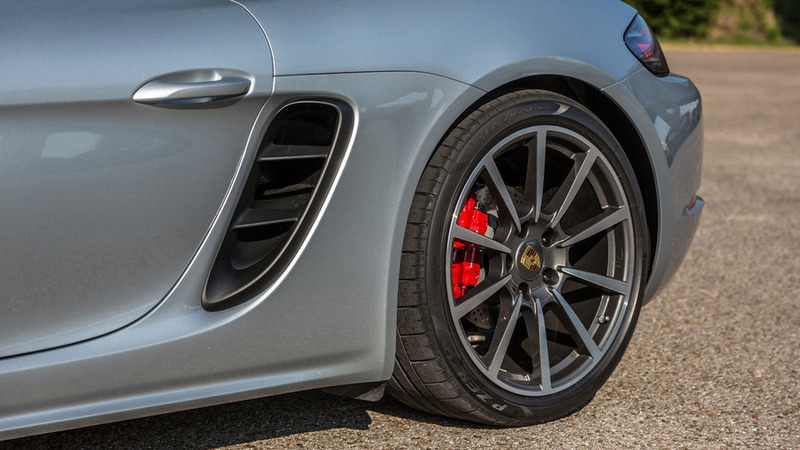 It’s true that the noise coming from the twin center pipes of the Cayman S isn’t sweet – but it’s edgy. More importantly, it hints broadly at galloping power and torque available from the new, turbocharged, 2.5-liter flat-four engine behind my right ear. 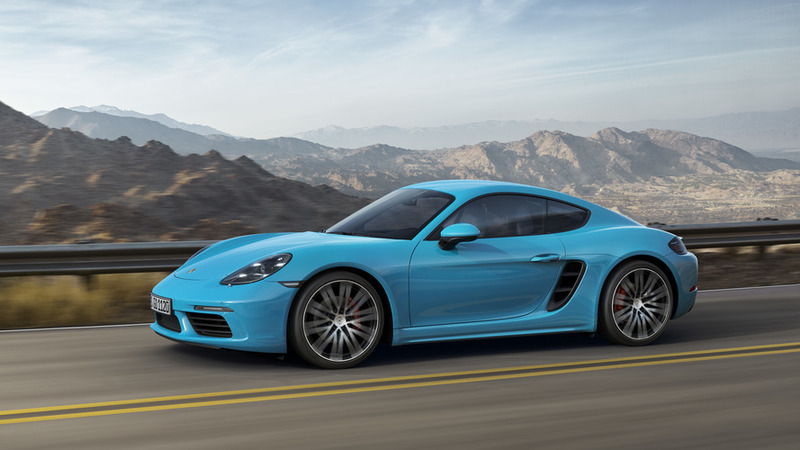 That’ll be 350 horsepower and 309 pound-feet of torque, or 25 hp and 72 lb-ft more than last year’s S. Porsche tells me that the variable turbine geometry of the Cayman S turbocharger has been derived from the 911 Turbo, which I appreciate, but not as much as the eye-watering pull of the coupe when I downshift from fourth to third gear, damn the torpedoes, and pass some dusty ranch truck like it’s my job. 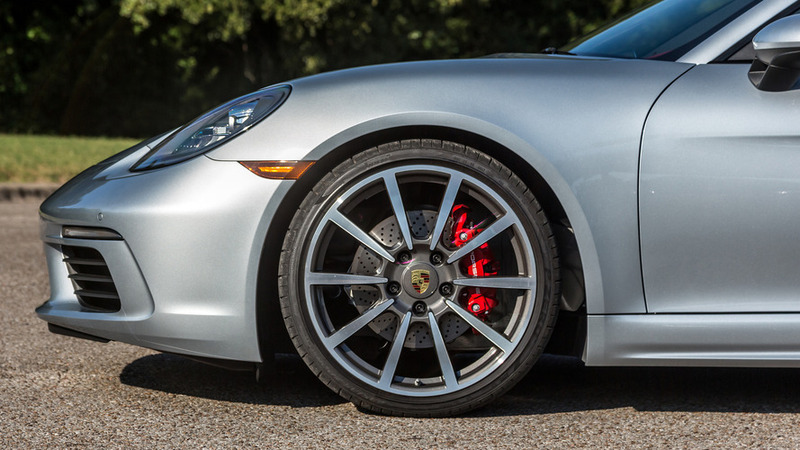 The 718 is damn-near unflappable under aggressive cornering. Porsche now offers the base 718 Cayman (and its Boxster brother) with a turbo’d 2.0-liter engine and 29 fewer pound-feet, torque that is missed after driving the 2.5T. Look for more on the base 718 later, and let it suffice for now that the “S” designation is more meaningful than ever. The highest praise I have for the application of Porsche’s PDK dual-clutch transmission in the 718, is that it’s fast enough to keep up with the pitbull of an engine. Snapping off shifts manually is of course effortless, but it’s also quick enough in response that I’d have to have expensive robot-arm surgery to keep up if I were using the standard manual gearbox. However, after driving a stint in the 718 Boxster S with that slower 6MT, I will admit that my foolish, meat-based brain prefers it and its invigorating action, despite its loss to the stopwatch versus PDK. 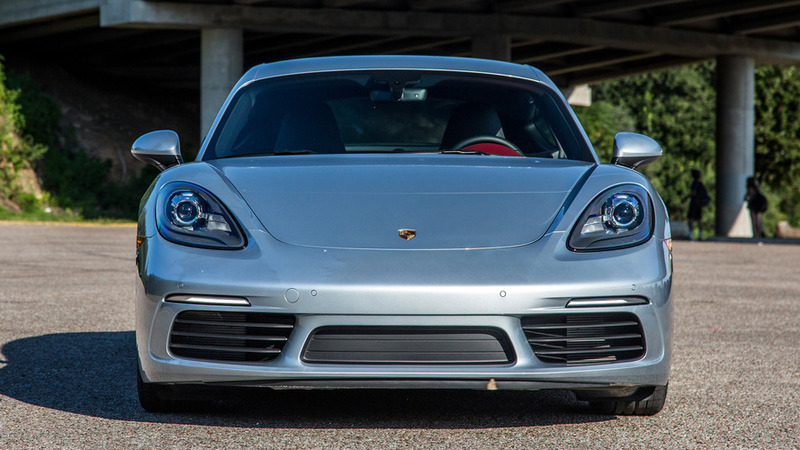 The gray matter might like rowing the Cayman’s transmission and fast-twitch turbo engine, but it’s gobsmacked with the way the Porsche coupe slithers over the ground. Luckily my time slot for driving some of the most riveting roads in Central Texas comes inconvenienced by only the lightest local traffic. So, despite not getting any track time in the car, I can report the 718 is damn-near unflappable under aggressive cornering. The highest praise I have for Porsche’s PDK transmission in the 718, is that it’s fast enough to keep up with the pitbull of an engine. Section widths on the ZR-rated tires run 235/265 front/rear, which doesn’t sound overwhelming, but it proves as sticky as I need, over and over again. Lightweight, MacPherson strut suspension at both ends of the vehicle keeps the supple rubber in neat contact with the big-aggregate Austin paving, gripping well enough to deliver all the power while sliding just a pinch (for flavor) when I over-drive the thing. 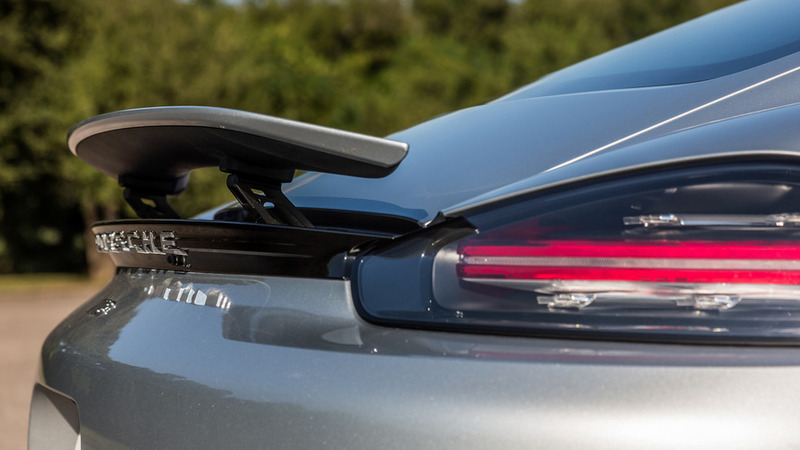 In fact, I find the accelerative pop out of quick corners downright surprising, until a Porsche engineering type reminds me – over a plate of barbecue – of the optional torque vectoring system for the rear wheels. A mechanical diff lock at the rear axle works in concert with some light braking of the inside wheel to basically clean up my exit trajectory and make me feel like a hero. Someone get me a cape with the Stuttgart crest. Steering offers a medium heft through a reasonable-diameter wheel; perhaps a tiny bit less full of road feel than I remember from my last Cayman drive, but still lovely. Even on the snaking drive route I rarely need more than a few degrees of lock with this super-direct system. And yet, the straight-ahead sections of two-lane highway don’t reveal any issues with skittishness – a great balance for a car that should legitimately be driven everyday. 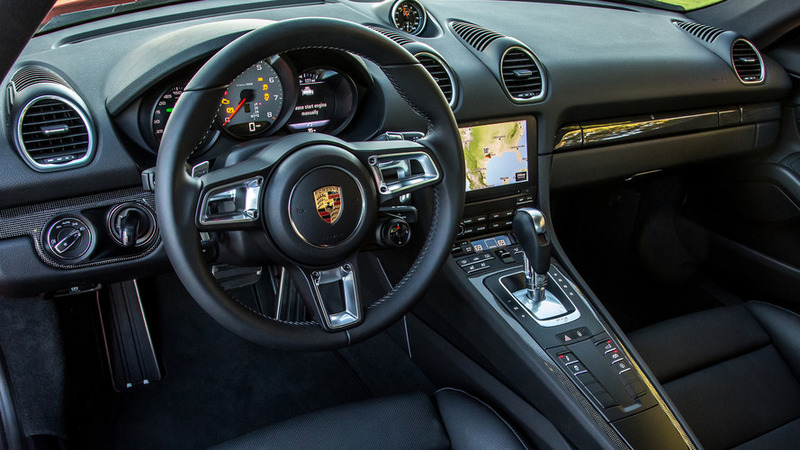 The steering wheel of PDK-equipped cars can also be had with a magic button to activate PSM (Porsche Stability Management) Sport Mode. I tap it with my thumb to raise the intervention threshold of the stability control, but without cutting the safety net altogether. The button also causes PDK to downshift, resulting in a sort of push-to-pass, or push-to-light-up-this-corner effect that’s downright intoxicating. Do it. Do it again. The leather quality is first rate, surfaces are soft, and the carpet has this quality that makes me feel like it’ll look good in 50 years. And hell, I fit pretty well behind the wheel! That’s no mean feat considering I’m six-feet, five-inches tall, and wider than ever after the lunch at Salt Lick. Don’t misunderstand: A drive longer than an hour will no doubt have me feeling a little sore, but there is room at least for my head, elbows, knees, and size 13 Nikes. If you’re the starting small forward for the Boston Celtics (hey Jae!) you might have an issue; but folks the size of my coworkers could live in this cockpit. 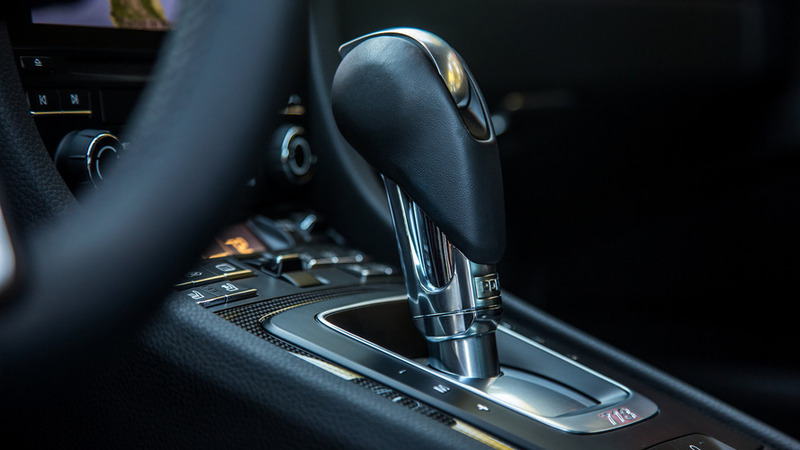 The space is appointed in a manner that I’ve become accustomed to with Porsche: a great feeling of quality and purpose but not much time spared for inventive design or overt luxury. This is more a place to work on reducing your lap time than to impress a date – even though the leather quality is first rate, surfaces are soft, and the carpet has this quality that makes me feel like it’ll look good in 50 years. It just doesn’t feel posh. The space allotted for cargo is, well, it’s there. 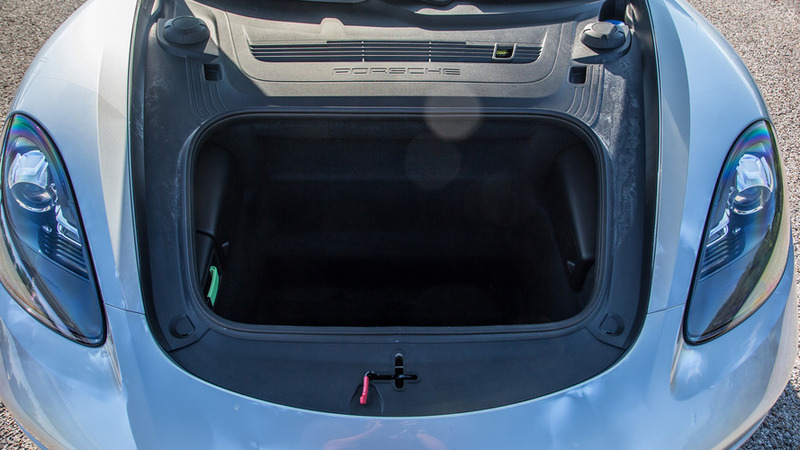 The 5.3-cubic-foot front trunk won’t swallow your week’s worth of luggage like a Corvette’s wide liftback might, but so it goes. Chevy will know the compromise associated with mid-mounted engines soon enough, I think, and in the meantime the Cayman doesn’t have to be a practical grand tourer. Its goal in life is to keep lit the fire in my belly, as I grow more confident and faster over the last few miles of a great driving day. As a famous Texan once proclaimed: mission accomplished. This is a natural progression of one of the world’s finest driving cars. 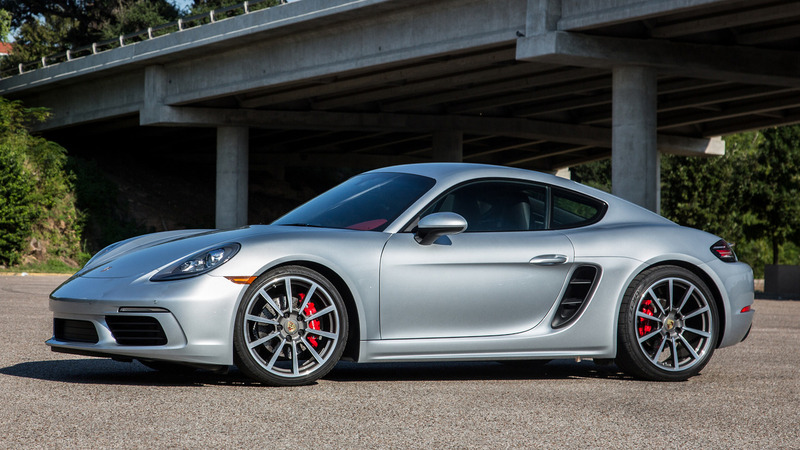 An un-optioned Cayman S asks heavily of your wallet; $66,300 before taxes or delivery. Blink, and the sticker flies up to the $93,010 I see on the build sheet in my glovebox; $3,200 for PDK, $2,370 for 20-inch wheels, $2,540 for a Sport Exhaust, and on, and on. You’ve all played with the configurator before, I’m sure you know how it goes. That’s a long way of saying that the Cayman isn’t just “Corvette money” any more, it’s bordering on “Z06 money” which is objectively nuts. But judging Porsches by Corvette standards has always been a little crazy; equally so, I’d say comparing the Cayman to something closer in price like the new Audi TT RS, or a Shelby GT350, or a Challenger Hellcat – those don’t feel like natural cross-shops. You want the Porsche, or you don’t. As I hand back the 718 Cayman S keys for the day – how many more days until another set is handed back, I wonder – it’s clear that I want it. A natural progression of one of the world’s finest driving cars, and a day in Hill Country, has me sold.